I rough-cut the grip scales on a band saw months ago out of a 1/4-inch maple plank from Lowe's. A more historical material would probably be Eurasian walnut (Juglans regia, aka Persian, English, European, Circassian or common walnut). Unfortunately the American black walnut planks I had on hand no more closely resemble Eurasian walnut than maple does. The maple was the remnant from the same plank I cut the scales for my letter opener from back in 2015. I sorted through the selection at Lowe's to get one with the most visible curl. After much dawdling and working on other projects, today I finally sanded them down to the correct shape. The most tedious part of the process is channeling out the undersides of the scales to fit into the flanges, and I failed to get a perfect fit. 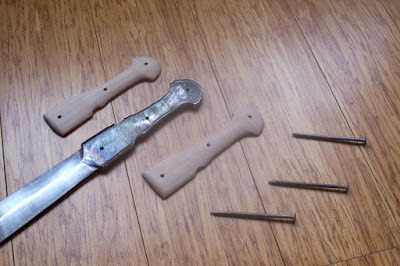 To the right are some common nails annealed by gas torch, which, when cut up, will serve as substitutes for the iron pins on the original. I think I'll be able to get two pins out of one nail, but we'll see. While a light brown stain might have popped the grain more and given it a slightly closer resemblance to walnut, I am awfully fond of the look of pale wood on dark grey steel (similar to the bone scales that were prevalent on similar swords in the late Bronze and early Iron ages), so instead I'm going straight to the linseed oil finish. Sufficient coats of linseed will turn pale wood golden yellow, a color similar to antique bone.